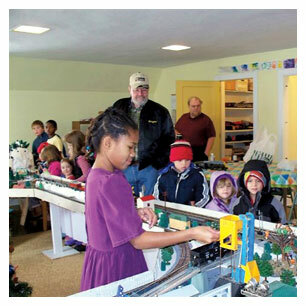 Our Saturday Trains Program is a free hands-on model train program for children and adults that is open every Saturday from 10 a.m. to noon at Christ Memorial Episcopal Church at the corner of Pine and East Market streets in Danville PA.
for the kids of the community. In the model railroad club where I’m a member, Loose Ties in central Pennsylvania, only a few of the other members are on the sunny side of sixty. And I’m told that’s closer to the rule than the exception for model railroaders almost everywhere. Many model railroaders are concerned about the future of their fun-filled hobby, and they wonder how to attract young people to it. My free program in tiny Danville, a nineteenth-century Pennsylvania iron town where the T-Rail was born, has drawn thousands of children, along with their parents, grandparents, aunts and uncles. And everybody has a great time! Danville is the home of one of America’s largest rural medical centers, and for nearly two decades I worked there with sick children, some so ill they couldn’t walk from one chair to another across the living room floor. For me, today, seeing children laugh and smile every Saturday morning is a great joy, one that makes me smile too. I invite everyone to our free program. Five-year-olds take the controls at our four transformers and send our trains hurtling down the track, smokestacks puffing. It would be enough to make a grown man cry if his $600 Lionel locomotive jumped the track and rolled over the edge of the layout. But our trains don’t have embedded microchips and fan-driven smoke machines. Most are older than I am, and in better condition, even after all their bumps and bruises. We’ve built fences around the edge of our layout, but if there’s a wreck we don’t feel too badly because we can fix our old engines and get them running again. Generous railroaders, some of them from the Loose Ties model railroad club and others from the public at large, have donated everything we have on our continually growing layout. We began more than four years ago with a 4x8 sheet of plywood, some castoff MTH track in a figure-eight, and a steam engine of mine. My church offered a large unused room, and the rest, as they say, is history. A crew of middle-schoolers came in and began to create mountains, laying down gutter screen, plaster cloth, and rock from the molds I used when I built my own home layout. They decided to make a winter scene of snow and white paint over the plaster cloth. That helped keep our costs down. They sanded, painted, drove in screws, designed and molded our first mountains and tunnels, blew the whistles, rang the bells and trimmed the Christmas tree. There was excitement and joy on their faces. They painted the rocks and cliffs with acrylic washes of raw sienna and burnt umber, and on one side of the figure-eight they laid out a ski resort with lighted trails running through groves of hemlock trees. Across the way, on the hill opposite, they carved out a frozen pond and a thin blue stream running down the mountainside. To bring the scene to life, several churchwomen loaned winter-scene figures from their miniature collections. Later, after a two-day holiday open house and a lot of newspaper publicity, we decided to extend the original 4x8 layout with a loop of two 18-foot-long runs that would let the kids really open it up. 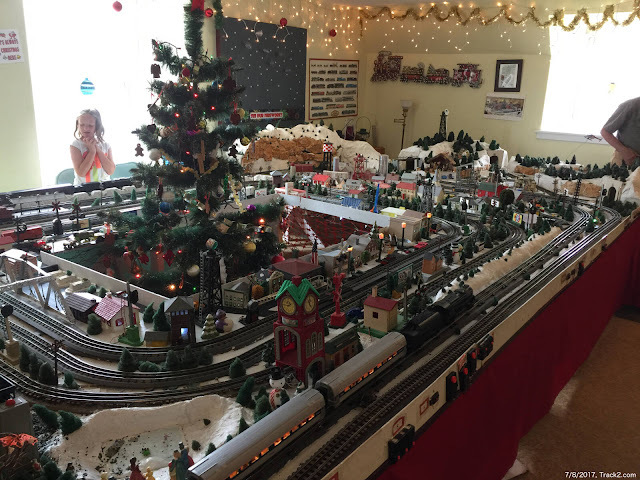 A Loose Ties club member with a collection of 300 trains donated a 1939 Lionel steam engine, a Union Pacific diesel from the 1950s, a 1928 standard-gauge crossing gate, and 50 feet of Lionel track that had been in a flood. Another man hauled in 50 feet of GarGraves track that he had torn out of his layout. 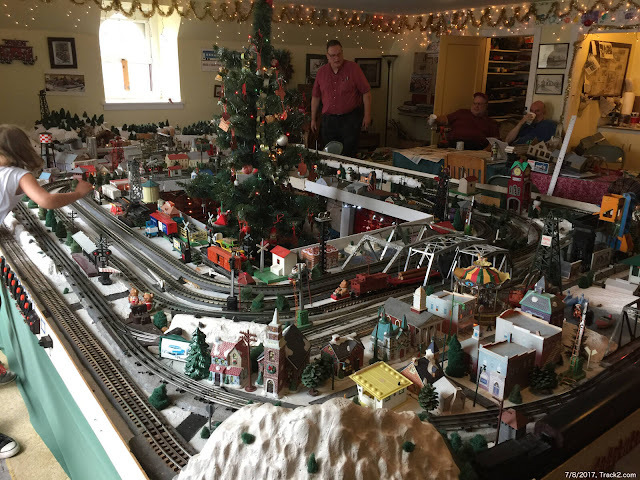 Visitors brought us a 1950s Marx steam engine with five cars; and a widow whose husband had been a cardiologist at the medical center donated 40 cardstock structures he had meticulously constructed over the course of his life. We acquired other attic donations; they are too numerous to mention here, but they have filled out our display beautifully. Week-by-week, using leftover rock that the middle-schoolers had previously cast, two neighborhood boys – one six and the other nine – began to build a large mountain and tunnel that connected our 18-foot straightaways to the original figure-eight layout. The sister of one boy helped paint the towering cliffs. One of our trains now disappears into the mountain and emerges suddenly on the other side. Every Saturday morning, we ask visiting children to help us make hemlock trees for the layout: at Home Depot we buy round green disks designed for commercial floor scrubbers, and the children cut them into tiny circles that they glue together to form conifers. So far they have made more than 400 perfect little trees for our display. One of our latest additions is a pair of Lionel 022 switches reconditioned from the 1950s that allow us to run a fifth train on the four tracks. With an electrically isolated center rail on the passing track, the young engineers jockey two trains around a farm where cardstock buildings shelter our pigs, cows and horses. We’ve also acquired three standard-gauge crossing lights that flash along one of the straightaways when a speeding train flies by, a Lionel mail car that the children activate with an unloading switch, two $8.95 Walthers crossing gates they can lower when the trains go by, and wonderful signals from Z-Stuff for Trains. We’ve made it fun to run the railroad. Visitors press momentary switches to unload a K-Line log car, sound a 1950s diesel horn hidden in a Lionel crossing-guard shanty, activate a K-Line Halloween accessory, illuminate a floodlight tower, start a tire swing, and run other accessories. Our hands-on Saturday program has introduced hundreds of children to the joys of model railroading. Three local newspapers list it every week in their Events columns, and we’ve seen visitors from as far away as Buffalo, Philadelphia, Indianapolis and Tallahassee. We also advertise that grown-ups are welcome to bring their own O-gauge locomotives and rolling stock to try on our big loops; when we were children, not many of us had 18-foot straightaways on our home layouts. More than two-dozen adults have brought in trains that had been packed away for 40 years or more. They were amazed when the old locomotives started up and ran effortlessly down the track. One advantage of our hobby’s demographics is that a lot of model railroaders are retired and don’t need to go to work every day. I’m not the only one who likes to see kids laugh and smile. If anyone reading this article wants to start or expand a model-railroading program for children, it’s the easiest thing in the world to do. In the beginning I devoted only two hours a week, on Saturday mornings, to my program. Now, thanks to the generosity of the Columbia Mall at Exit 232 on Interstate 80, we have free space for a second program that you’ve been reading about on this website. So our commitment now adds up to four hours a week on Monday afternoons and Saturday mornings. It isn’t all that hard for us to do – and the rewards are great! One of the secrets to our success comes from motivational speakers who tell their students: “Ask for what you want.” Churches, public buildings, and shopping malls have empty rooms that they will let you use rent-free. 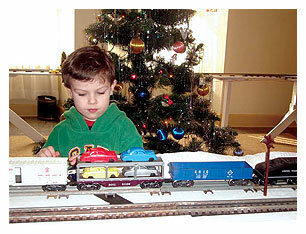 Collectors often have a locomotive or two to gladden the hearts of children. Once the public knows you’ll take donations, people will clean out their attics for you. A Loose Ties member put our display on YouTube; another volunteer, a professional graphic designer, has built this website to spread the word about Wheelchair Engineers. We’ve had thousands of hits and several donations – from as far away as Minnesota – as a result. I saw, in the national railroading magazine Classic Toy Trains, a notice from the Michigan-based Lawrence Scripps Wilkinson Foundation. The foundation’s website at wilkinsonfoundation.compictures and describes famous model trains it has collected as part of its research into American railroading. The foundation owns 275 famous trains, representing models of real trains that were glamorous flagships of the great American railway systems. The note I saw offered to donate free trains to the operators of museums, restored railroad depots, or 501(C)3 charitable organizations. We applied for a passenger train, and one November afternoon a delivery truck rolled up to our door with a brand new seven-car K-Line Broadway Limited. This is something new so, to protect it, we’ve installed a speed regulator on the track. By the time Classic Toy Trains ran an article in May 2009 about our Saturday Trains program I’d decided to build a second public train program, for disABLED children and adults. When I designed our layout, I anchored the ¾-inch plywood straighaways to single 2x4 posts, leaving four feet of space between each support. At 31 inches, the height of the trackbed is just right for a wheelchair-bound child or adult. In our Wheelchair Engineers program a disABLED person sitting in a wheelchair can work comfortably and enjoy model railroading. For anyone who wants to start a similar program, shopping malls today often have unused space that they will donate free to get a program going. Mine is a small town – Toni Morrison, the Nobel Prize winner, used it in her 1978 novel The Song of Solomon. People come up to me on the street and thank me for running these model railroad programs. They don’t know how much joy I feel, seeing the children smile. 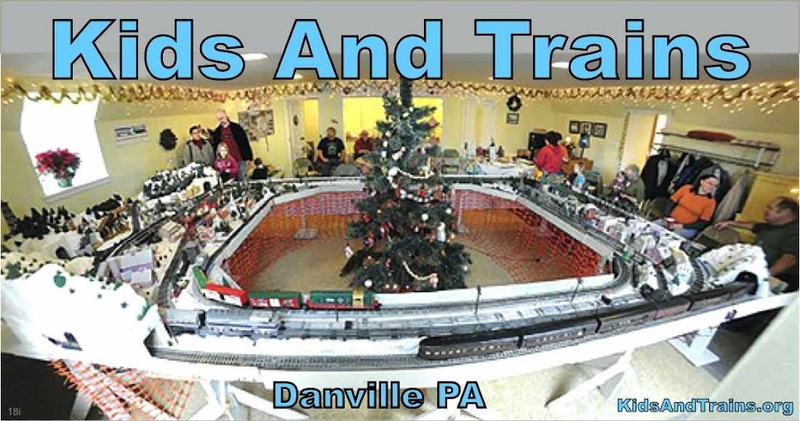 Our Saturday Trains model train program is located on the 2nd floor of the Christ Memorial Episcopal Church, 120 East Market Street in Danville PA 17821 (the Southwest corner of Pine & East Market streets). * Old 'Wheelchair Engineers' website on archive.org (from webs.com, Jan. 2014 backup) NOTE: Wheelchair Engineers ceased operation in April 2015.